Palau is considered one of the world's premier dive destinations, with dozens of dive sites in a rare variety: walls with fascinating coral formations, reef corners where the currents attract sharks, rays and schooling fish, channels and other sandy bottom sites, tunnels, holes, caves and caverns, and plenty of WWII freighter and plane wrecks. From macro to mantas, Palau has it all! Famous not only for its diving, Palau is also known worldwide for its array of mushroom-shaped rock islands which dot the sea, creating color combinations of emerald, turquoise and aqua where jungle meets ocean. And as if that wasn't enough, we selected the newest resort and largest most reputable dive operator in Palau. Don't believe the hype? Guess there's only one way to find out. Palau is one of the most extraordinary diving spots on the planet. Located in the southwest corner of Micronesia, the Republic of Belau (the traditional name) consists of an archipelago of over 300 islands spread north to south over 100 miles from the atoll of Kayangel to the island of Angaur. Palau has a tropical rainforest climate with an annual mean temperature of 82°F (28°C). Rainfall is heavy throughout the year, averaging 150 inches. The average humidity is 82% and, although rain falls more frequently between July and October, there is still much sunshine. Typhoons are rare, as Palau lies outside the main typhoon zone. The resort's largest room type. Located on the 3rd floor and features a bay window overlooking the bay. Complimentary breakfast included. Palau is one of the smallest countries in the world in terms of land mass, ranking 197 out of 249 countries and territories. What it lacks in dry land, Palau compensates in wet variety, offering some of the most biologically diverse waters in the entire world. Palau's marine ecosystems include barrier reefs, fringing reefs, inner lagoons, sea grass beds, marine lakes, and mangrove forests. Palau's pristine marine habitats support some of the richest populations of corals, fish, and other invertebrates. With over 1,500 species of fish, abundance of large pelagic animals and over 700 species of corals, Palau is one of the most diverse tropical zones in the world. Palau is located at a crossroad between the Pacific Ocean and the Philippine Sea, just outside a geographic region of the world known as the "Coral Triangle". Palau falls strategically in the path of transient pelagic creatures, such as whale sharks, whales and dolphins, and is home to the world's most remote and isolated population of dugong, an endangered marine mammal. Within the diving community, Palau is famous for its shark population, numbering over 130 species! In 2009, Palau became the world's first Shark Sanctuary, prohibiting commercial fishing operations from catching sharks. Palau has the largest abundance of marine lakes in the world, a unique ecosystem containing small, isolated populations of organisms. One of those lakes is Jellyfish Lake, with millions of non-stinging Golden Jellyfish. Palau was declared by National Geographic Society as the first Underwater Wonder of the World, and was featured on Discovery Channel's “Living Edens” series as one of the world's last living Edens. SKILL LEVEL: There’s something for every diver here, from beginner to intermediate to seasoned veteran. Sam’s Tours is a PADI 5 Star National Geographic Dive Center based in Malakal Harbor, Koror. Recognized for its exceptional and personalized customer service, Sam’s offers scuba diving trips, snorkeling trips, Rock Island tours, kayaking with Planet Blue Kayak Tours, land tours, camping trips, fishing trips, sailing charters and more. Sam’s comes with a professionally trained crew that always goes the “extra mile” for its customers. The owner Sam Scott is an American who came to Palau when he was 20. He is the stepson of the Paramount High Chief of Koror. Sam’s limits the number of divers per boat to eight and its fleet of 8 dive boats is equipped with twin engines, VHF radios, DAN oxygen kits, sun canopies, and first aid and tool kits. For your safety, all dive guides and boat operators are First Aid and DAN oxygen providers. Comprehensive dive briefings with an emphasis on marine life and environmental protection are always part of the day’s events. The boats are custom-made for safety and comfort, and have twin engines for safety and speed, carry communication devices, DAN emergency oxygen kit, first aid kit, and canopy for sun protection. The maximum number of divers per boat is based on comfort and space, and they maintain an 8:1 guest to guide ratio on all tours. All crew members are experienced and knowledgeable; their boat captains are locally licensed professionals who know Palau's waters and reefs like the backs of their hands; their dive guides can only lead dives after completing 200 dives in Palau, learning each dive site and the complexity of sea conditions, in order to be able to provide a safe and enjoyable diving experience for every level of divers. With several marine biologists on staff, Sam’s Tours offers all guests a wealth of knowledge about diving in Palau. They also offer regular lectures, open to all guests, covering various topics of Palau’s diverse marine environment. After over 25 years in the diving business, Sam’s Tours remains committed to provide the best diving experience, and Sam’s Tours won the TripAdvisor Certificate of Excellence for four consecutive years since 2012! **PLEASE NOTE** The dive sites below are just examples and are not guaranteed. All dives sites are subject to weather conditions and local seasonal knowledge and the final route taken is at the absolute discretion of the captain and dive guides. The corner is a flat plateau, running a couple of hundred yards out to sea before dropping off abruptly. It is consistently active with big and little fish due to strong tidal currents. Small hills, sand tunnels and gorges cut into the reef. Depending on the direction of the current, the pelagic fish will switch from one side of the corner to the other. Gray Reef Sharks and White Tip Reef Sharks, Blue Fin and Big eye Trevallies, large schools of Jacks and Snappers, Hawksbill and Green Turtles, Groupers, schools of Barracuda, a variety of small tropical fish, Napoleon Wrasse, Bumphead Parrotfish, Moray Eels, Mackerel, Wahoo and, on occasion, spotted Eagle Rays. The critter list is almost endless: Leafy Scorpionfish, Nudibranchs, Lionfish, Anemone Fish. Bigger pelagics are occasionally seen at the deeper reaches of Blue Corner: Hammerheads, Bull Sharks, Tiger and Whale Sharks, Marlin, Sailfish, Whales, Mantas, schooling Yellowfin and Dog Tooth Tuna. Jellyfish Lake is a marine lake located on Eil Malk island in Palau. Eil Malk is part of the Rock Islands, a group of small, rocky, mostly uninhabited islands in Palau's Southern Lagoon, between Koror and Peleliu. There are about 70 other marine lakes located throughout the Rock Islands. Millions of golden jellyfish migrate horizontally across the lake daily. Jellyfish Lake is connected to the ocean through fissures and tunnels in the limestone of an ancient Miocene reef. However the lake is sufficiently isolated and the conditions are different enough that the diversity of species in the lake is greatly reduced from the nearby lagoon. The golden jellyfish, and possibly other species in the lake have evolved to be substantially different from their close relatives living in the nearby lagoons. Please note that Jellyfish Lake is currently closed but will hopefully be open when we get there. During the German occupation of Palau, guano (phosphate) was mined on the southern island of Angaur. In order to bring guano to town, the Germans blasted and dredged a channel that connected the inner lagoon with the open ocean. The outside mouth is dived on the incoming tide, when nutrient- and plankton-rich current flows into the inner lagoon. 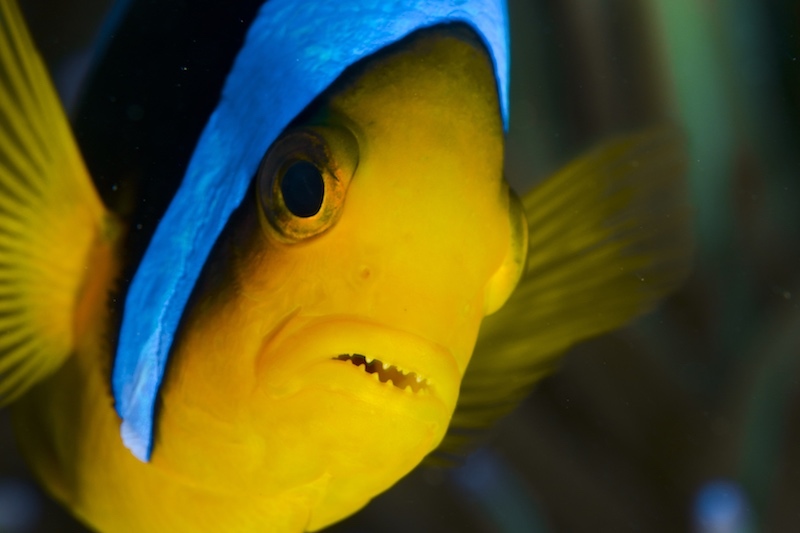 Known for Manta Rays, schooling sharks and an abundance of tropical fish. Schooling Jacks, Barracudas, Trevallies and Snappers. Cuttlefish and Black Tip reef sharks in the shallows. Sandy bottom is home to Garden Eels and Blind Gobies. Mantas can usually be seen feeding on plankton at the mouth of the channel. Both Mantas and Reef sharks are known to get cleaned by Cleaner Wrasse and Butterfly fish at the cleaning stations in the late afternoon. A cave system made up of five separate, connecting chambers with air pockets (4 are water-filled). Over the millenniums, rainwater, percolating down through the limestone, eroded the interior of the islands, forming vast cave systems. Chandelier Cave was once an open-air cave. The stalactites and stalagmites slowly grew into formations resembling glittering chandeliers. After the last ice age, the water level slowly rose, completely concealing the cave's entrance. Developed from years of data gathering, experience, and knowledge of Palau diving, Paul Collins and Richard Barnden created Unique Dive Expeditions, who will be leading this trip for us. Based on the monthly lunar cycles, Unique Dive Expeditions offers a once-in-a-lifetime diving experience. During Full and New Moon, different species of fish gather in huge aggregations to spawn. Numbers can vary from hundreds to thousands depending on the species. These mind-blowing spawning events usually attract Palau's biggest predators as well. One of the best loved sightings among divers is the Bumphead Parrot Fish (Bolbometopon muricatum). 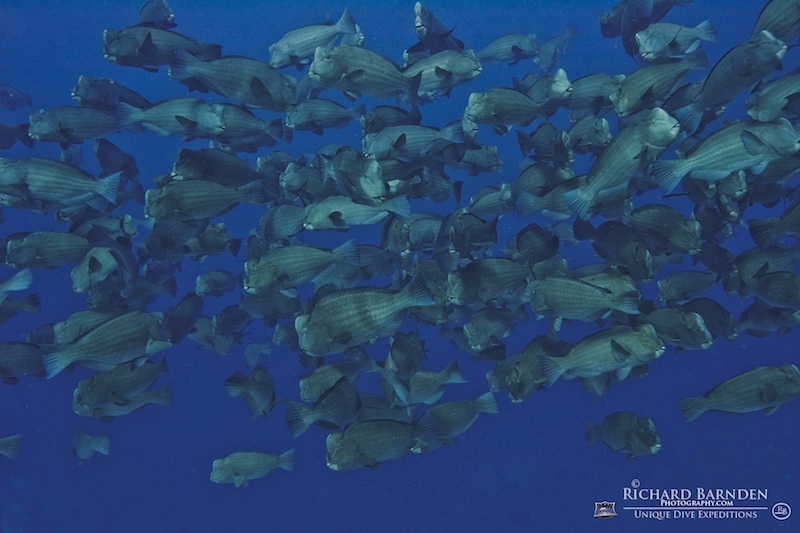 Often seen patrolling the reefs in schools of up to 20 or more, these encounters are favorites for many divers, but imagine an aggregation of nearly a thousand individuals! The New Moon Expedition takes us to a remote dive site, where aggregations begin forming early in the morning. Awaiting the exact time for spawning, hundreds of Bumphead Parrot Fish from all around the area join one another for what is about to be an unforgettable event. Building up to this spectacular showdown, males begin their display of dominance, attempting to attract as many mating partners as possible. As females continue to gather, the school spills out into the blue where the tension erupts into a climatic mating dance. 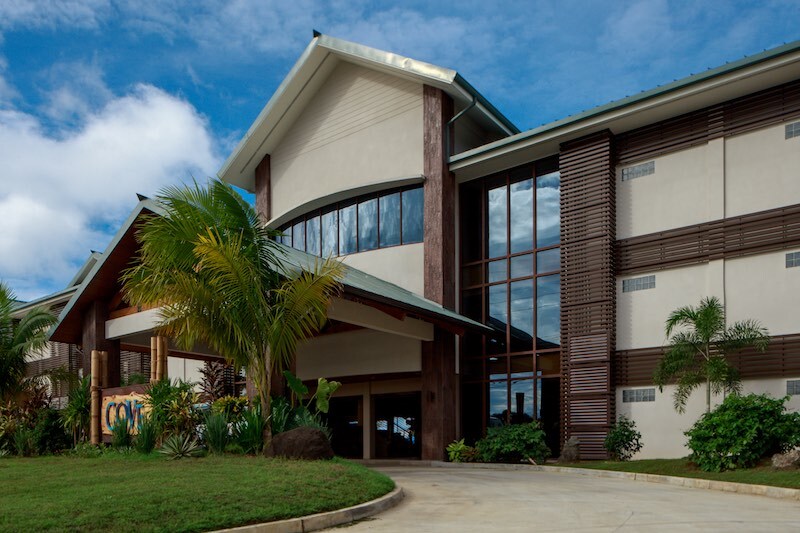 Cove Resort Palau: free WiFi access in the room, lobby and restaurant for email access only (limited signal strength). One free Palau Telecom hotspot $10 card per room. Sam’s Tours: WiFi available. Guests must purchase a Palau Telecom hotspot $10 card valid for 15 hours.